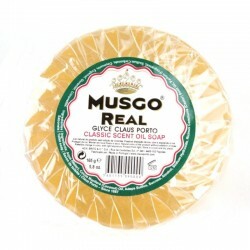 Claus Porto, the company behind the Musgo Real brand began producing soaps and perfumes in Portugal in 1887. Now the Musgo Real collection is a mix of the modern and traditional. Using time honoured techniques passed down from generation to generation Claus Porto produce handmade soaps, shaving creams, shower gels, after shave and colognes from natural products for the modern man.